Julien Baker, Phoebe Bridgers, and Lucy Dacus, three of indie music’s most compelling singer-songwriters, have recently blessed us by coming together to form a modern-day millennial supergroup. 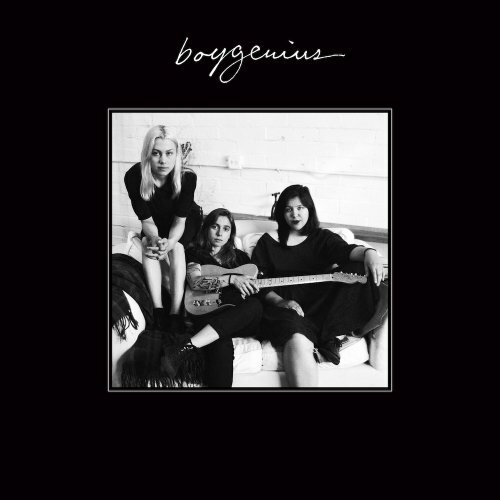 After teasing the masses with singles since late August, the trifecta perfecta finally dropped a gorgeous EP, christened “boygenius,” on all major streaming platforms, with the physical release slated for Nov. 9. I pulled only from the 21st century. My deep-seated fondness for acoustically inclined, white male pseudo-rockers from the ’60s would have made this list rather boring otherwise. The Traveling Wilburys. Crosby, Stills, Nash & Young. Cream. Derek and the Dominos.These supergroups, though all fabulous, are cut from similar cloth — and in some cases, guilty of double dipping. I’m looking at you, Eric Clapton. My working definition of supergroup here entails small-scale collaboration — think duos, trios, larger bands within reason. Thus, amorphous musical collectives such as Broken Social Scene are not eligible for inclusion. Finally, I am only considering supergroups that produced no more than two albums together (thus far), and consisted of artists with fully fledged solo careers. The collaboration cannot be the primary sustained artistic project for any of its contributors. For example, Killer Mike and El-P now devote the majority of their artistry to Run the Jewels and are working on a fourth album as a duo. So, according to my own rules, and also to my own chagrin, no go on RTJ. When these two cheeky troubadours came together last year for a joint release, it was exactly as breezy and clever as you would expect. Both artists thrive on delightfully disarming lyrics set to classic folk melodies, and the songs they produced together were quietly affecting, from the chummy warmth of “Continental Breakfast” to the twangy, poignant “Untogether.” This is modern cerebral Americana, delivered gorgeously by an Australian and an affable rock star. It helps that the two are great friends. With this kind of chemistry, Barnett and Vile better have some more music cooking. It’s the thrilling Jack White collaboration you remember from the mid-aughts. No, the other one. Composed of Jack Lawrence and Patrick Keeler, both of The Greenhornes, as well as solo artist Brendan Benson and, of course, modern rock hero Jack White, The Raconteurs made some seriously good music together. They also were pioneers of the Surprise Album Drop years before Beyoncé made it cool. White would go on to develop his critically acclaimed solo career, and the band’s other members faded from the front pages of Pitchfork — but rumor has it they’re back in the studio, with a release slated for 2019. Now is the time where I should probably disclose my angsty adolescent infatuation with Death Cab for Cutie. But this collaboration between DC4C frontman Ben Gibbard, electronica artist Jimmy Tamborello, and Rilo Kiley vocalist/solo legend Jenny Lewis was objectively hard to ignore. You’ve probably heard Postal Service’s pop-tinged emo creations on every TV soundtrack from the last 15 years ever, or maybe a very hip elevator, but “Such Great Heights,” that iconic mid-2000s earworm, stands the test of time. Also, the actual United States Postal Service sent them a cease-and-desist letter, which is quite punk. Listen to: “No Church in the Wild"
Could it be anything else? Rarely do two artists with such genre-surpassing cultural firepower join forces to drop a full-length album, but thank the Lord for the real rap gods. Some may argue that these tracks simply do not stand up individually against either of the artist’s best solo work. I say, it doesn’t matter. This album captured the zeitgeist like few other collaborations ever have or will. Are they a supergroup? Perhaps not. But that two rap titans came together to give the people exactly what they wanted, and dropped some of the most iconic songs of the decade while they were at it, cannot be disputed. And that’s pretty super. The Shins frontman James Mercer and perennial collaborator Danger Mouse were electric together. I would have ranked them on the actual list, except that I’m not sure Danger Mouse’s solo career fits my demanding criteria. Nevertheless, Broken Bells is worthy of existing at least somewhere in the collaborative canon. Cee Lo Green and producer Danger Mouse’s collaboration would be relatively forgettable if they hadn’t produced one of the greatest songs of all time, and also the first song I ever bought on iTunes. If anyone cares.